In dojos for Japanese martial arts such as Kendo or Judo, there used to be a Shinto altar inside the dojos. Some dojos that have a history still have Shinto altars, but many others have no such things now (some hold national flags instead). Thus, today Kenshis bow toward "the front" (Show-men) instead of bowing before the altar. To practice well and to make the fruits of that day's practice your own, you show your respect and gratitude for your senseis and your seniors who instruct you. When you make these two types of bow (1 and 2), you are supposed to tilt your upper body roughly 30 degrees forward. Since you are bowing to the alter or to senseis whom you deeply respect, you need to bow deeply enough to show your gratitude. After keeping your head down for a while (about the length of one breath), you quietly put your upper body back to the original, upright position. This is what you do during practice or before and after Kendo matches. Here, you are supposed to tilt your upper body about 15 degrees forward while looking straight into your partner's or opponent's eyes. You should keep looking into his or her eyes and never look away until you finish bowing. In any type of bowing, what is most important is to bow together concomitantly, connecting with one another. It is not considered fully respectful if you only bend your head forward or nod (instead of tilting your entire upper body forward) or if you selfishly incline your body without considering your partner's timing to bow. 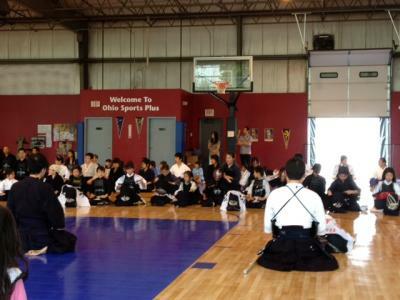 Let us learn and master proper ways of bowing through Kendo, and apply them to our daily life.